Successful events are all about making sure the presenters message is professionally delivered. 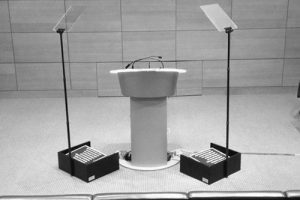 For conferences and events our presidential style autocue systems are very popular and we can integrate them with plasma screens and projection equipment. We use the best software available which is flexible and has the ability to make script changes quickly and easily. Autocue are also known as teleprompt. If you’re looking for reliable yet affordable autocue or teleprompter hire in London then look no further than EMS Events, where you’ll find a range of hire options at what we believe to be a very competitive price. Whether you’re needing an autocue for a single day or a longer period, our flexible hire options mean you’re able to hire exactly what you need for as long as you need it. We offer the latest prompting equipment and most importantly, support of a professional operator to ensure you get your message across efficiently and effectively. Always be correct and in time with our autocue & teleprompt systems for hire. 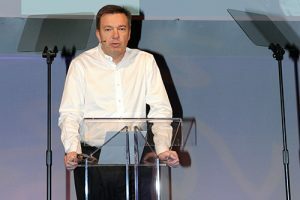 These autocue and telepromt systems are increasingly being used at conferences and events. We use the latest software available which is flexible and has the ability to make script changes effortless and easily cue your scripts allowing for a smooth and seamless event or function. 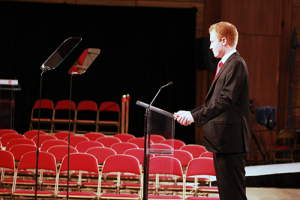 We offer a complete autocue / teleprompter hire service from our base in Central London. We deliver our autocue systems to your location, set them up and then operate them for you, so you don’t have to worry about anything!